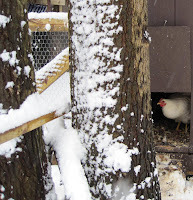 The chickens are not that fond of snow and cold. They're managing in their unheated, unlit hen house and venture out for water that has frozen during the day since mid-December. Because I have not invested in a water heater, it's my duty to carry out fresh water twice a day or more, depending on how cold it is. Besides the satisfaction of raising my own absolutely delicious eggs , the next best aspect to keeping chickens is my heightened connection to what's happening outside. I must monitor the weather to determine how often fresh water is needed, or if to move the feed can inside in case of rain. I like to keep the feed outside to encourage them to spend time outside. Like a farmer, I keep tabs on the weather. It's like having a pet or a child -- they occupy a corner of my radar screen. Like a pet or a child, rewards accompany the responsibilities. 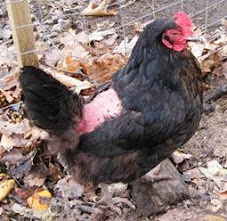 I still haven't decided whether chicken keeping is a long-term avocation. My son Ian, 25, an organic farmer whose friend raises chickens advised me to "Put a light out in the hen house to increase my yield" during winter, when egg production decreases along sunshine. It would require cracking a window to run an extension cord or Bob to install an outside outlet and running an extension cord. I'm collecting about two eggs a day, which could double if I illuminated the hen house from 4 am to 6 am. I have the timer, light and extension cord. I even have Bob. What I don't have yet is the time for Bob to upgrade the technology. Electricity changes farming. I could use it to heat my water. We're managing so far with traditional means. Increasing my yield is tempting, however, now that all five hens are producing. I do love collecting the eggs and eating them. Raising chickens can always be counted on as party conversation because it's still such a novelty. More than that is the "chop wood, carry water" reminder that we depend on the earth, weather and animals for our existence, a reality we usually overlook.